Dentist Encino: Should I Get an Electronic Toothbrush? One question we get asked all the time is about whether or not people should choose to use an electric toothbrush over their manual counterparts. At Balboa Victory Dental, we always strive to answer questions from our patients as thoroughly as possible, so here we go! Should You Get an Electronic Toothbrush? If you’re torn between the choice of an electronic toothbrush upgrade or sticking to the manual brush, we may be able to help you with the decision. Of course, we don’t stand to gain anything from convincing you to use either one; our only interest is in improving the oral health of our patients in the Encino and Lake Balboa area! Regardless of whether you choose to use an electric or manual toothbrush, the absolute most important thing to keep in mind is that the duration and technique behind your brushing should be seen as the most important. If you are not brushing twice a day for 2 minutes each time, then neither toothbrush is doing its job. Ever since the advent of electric toothbrushes, numerous research studies have maintained that any difference between the two is negligible in comparison to a lack of brushing altogether or regularly. Our dentist, for instance, is unlikely to ever request you switch or upgrade your toothbrush, but consistently reminds patients of the importance of brushing first thing in the morning and last thing in the evening every single day for at least two minutes. One thing that frustrates us is the prevalence of advertising and marketing that seeks to trick you into an, often expensive, upgrade. 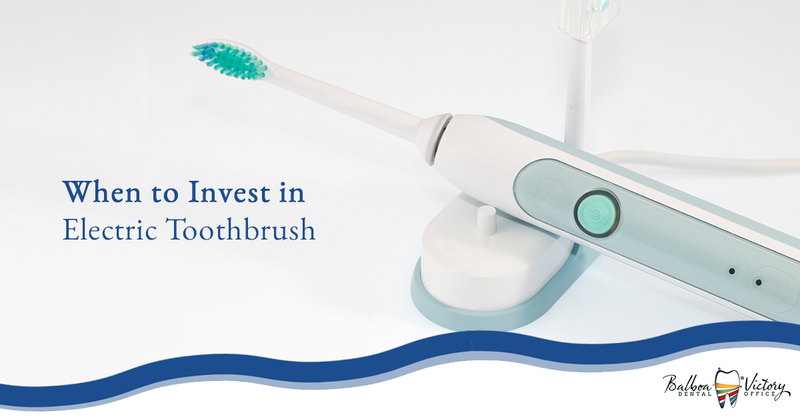 Many of our patients falsely believe that spending 20 times more on a fancy electric toothbrush over a manual brush will bring them an equally enhanced benefit or allow for a reduction in time or attention spent on brushing; this is entirely false! One of the most dangerous things about the marketing and advertising efforts behind electric toothbrushes is that they often seem to suggest that the brushes immediately shake and scrub off plaque (as is often demonstrated by television commercials), which can trick their customers into only brushing for a fraction of the time that they should. In instances such as these, no electric toothbrush will measure up to a properly used manual toothbrush, which is likely why many dentists are unwilling to recommend them to their patients. We have seen plenty of instances that go completely against what we have said, but they are almost all directly linked to a patient with restrictive needs that are alleviated with an electric brush. For instance, patients that suffer from an issue with one of their arms, hands, or wrists often find it much easier to brush with an electric brush that requires much less coordination to achieve a great result. It is for this reason that we recommend electric brushes to patients that are either already seeing success with their electric brush or for those that struggle to brush under regular conditions, as electric often provides a simple, effective solution. If you’re in the Encino or Balboa Lake area, be sure to contact our dentists for more information on oral health care, appointment availability, and even our personal two cents on whether or not you should use mouthwash. Our dentists are skilled in a number of general and cosmetic dentistry services geared toward people of all ages, making Balboa Victory a great choice for the entire family! Contact us today for appointment availability!